Here, we're less interested in the Massimo Vitali photograph itself than what it has captured: more or less a construction scaffolding smoothing out a patch of irregular terrain. 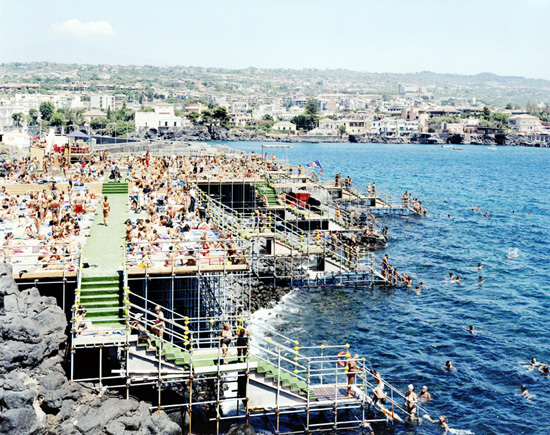 Less designery and messier than Vicente Guallart's microcoasts and hexagonal beaches, this seemingly ad hoc intervention creates an occupiable public open space on the rugged coastline of Catania, Sicily, where before only the daring few ventured out. Simultaneously, the structure provides an easy and safe access to the waters of the Mediterranean, an important recreational asset to the local community as well as an obvious exploitable asset for its tourism industry.